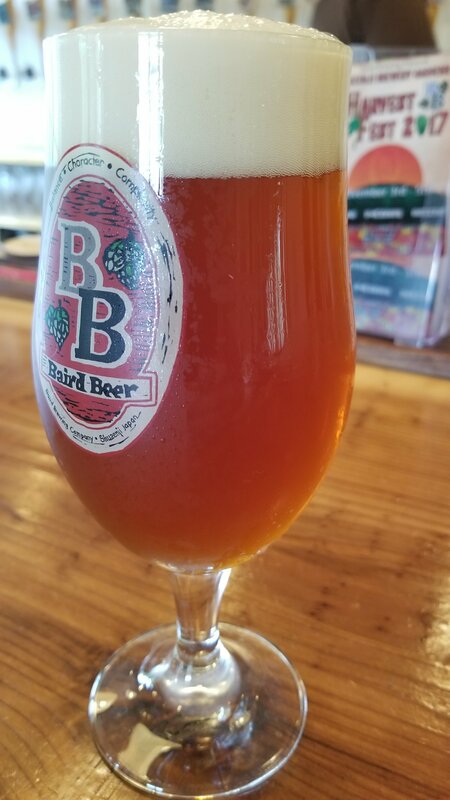 Baird Fire in the Belly by Baird Beer, or to give it its full name Baird Fire in the Belly – Doug’s Red Ale, is a 6% amber ale from Baird Beer, based in Shuzenji, Shizuoka. It’s part of their seasonal draft range, though we’ve heard it has made it into bottles a couple of times. Baird Fire in the Belly is dedicated to their friend, patron, partner Doug Benning, who passed away in 2012. Baird Fire in the Belly is brewed using Floor-malted Maris Otter, Munich, Rye, and Caramel, then hopped with US Warrior, Millennium, Northern Brewer, Sterling, and Willamette. I’ve been looking for Baird Fire in the Belly since it came out and I’ve either missed out on it because it sold out or I couldn’t get to the bar before it sold out. It may have taken four hours of travelling to get to Baird Beer Brewery Gardens Taproom, but Baird Fire in the Belly was mine! Baird Fire in the Belly came up a copper orange colour with a fluffy white head on top that lingered for a good five minutes before collapsing onto itself. There was lots going on in the aroma, with caramel and biscuit aromas coming off of the malts, along with a grapefruit, pineapple, and some pine resinous hints coming along too. Ambers aren’t a style well done in Japan, with past attempts either being too sweet, or too thin, but Baird Fire in the Belly sits right in the middle of those two. It had a medium dry bitterness to it, with the hops producing more of a resiny quality to it than a citrus one. It’s a very drinkable amber ale that is more refreshing than cloying. Baird Fire in the Belly finished off with some lingering caramel sweetness and slight bitterness to it. Baird Fire in the Belly is one of the better Japanese amber beers – well, what are you doing still reading – go buy it.